The Creeping Flesh (1973) is the kind of movie that would have made H.P. Lovecraft proud. A Victorian doctor, Emmanuel Hildern, played by Peter Cushing, comes up with the kind of crackpot theory that perfectly caricatures the mix of weird science and imagination run amok in that era: Evil, he hypothesizes, is a curable disease! Like any other virus, all he has to do is come up with the correct antidote. Hildern’s epiphany, in the tradition of many of our greatest scientific discoveries, results from a laboratory accident. Here is where the story is a hundred percent Lovecraft. Hildern has dragged home from New Guinea the skeleton of a here-to-fore undiscovered race of humanoid giants. This race is older than Neanderthal Man, predates the oldest bones of humans ever found. Our story picks up in earnest when Hildern starts to clean the skeleton’s hand with water and, to his horror, realized the bone starts to grow flesh. By extracting blood from the monster’s severed middle finger, the doctor is able to examine it under his microscope, and soon discovers that its spidery black cells are predatory: hence, Hildern’s theory that these giant beings with their larger than human skulls were pure evil. The theme of an ancient, perhaps even alien race that passed their knowledge down to humans is not altogether original. Lovecraft’s Old Ones definitely spring from real historical mysteries. Whether Stonehenge, the Pharaoh’s pyramids, or Mayan astrology, there is still much about the great strides made by early human civilization that defies the full comprehension of contemporary scientists. Colin Wilson, a sometimes Lovecraft acolyte, for his part, takes the theme to bizarre extremes in The Philosopher’s Stone. Wilson can be a bit annoying as a writer, partly because his heroes are always the most pretentious genius-know-it-alls, and partly because the stories are not action driven, but are rather didactic explanations of his various pet meta-themes. Foremost among them is the opposition between Enlightenment thinking and Romanticism, the radical struggle between rational and irrational ideas about creativity. Wilson’s The Mind Parasites, published two years earlier in 1967, takes its theme from the almost inexplicable extremeness of the nihilistic Romantic backlash to the Neoclassical era. Such a total ideological reversal, Wilson proposes, is really hard to explain. Only an explanation equal to so staggering and sudden a cultural shift will do. And where does the human mind go when things are hard to explain? Why, to mythology, of course. In many ways Wilson’s subject is what happens when logic becomes over extended and begins to break down into the fantasy from which it originally emerged. When there is no epistemological explanation the scientific mind becomes desperate. In The Mind Parasites the answer for the collapse of Enlightenment logic into irrationalism is appropriately glib: Space aliens are to blame! Two years later Wilson has reversed his position. In The Philosopher’s Stone Romantic creativity is no longer the enemy, nor is it the result of hypnotic suggestion by a race far more powerful than ours. Once again, the conspiracy leads back to ancient astronauts asleep miles beneath the earth in their cyclopean cities. Only this time, as with The Creeping Flesh, it is the prehistory of evil Wilson is concerned with. There are many thematic similarities between the otherwise unrelated book and movie. While Wilson’s stock anecdotal speculations are scattershot (he is a great proponent, for example, of the hypothesis that Shakespeare’s work was really written by Sir Francis Bacon), among the core inspirations for The Philosopher’s Stone are the dubious ideas of Hans Hörbiger. Hörbiger called it his Cosmic Ice Theory. Basically, Hörbiger argued that the moon does not hold its position but slowly and surely spirals to the earth. There have been many prior moons and the results have always been the same. Eventually they have all crashed to the earth with cataclysmic results. The German occultist argued that only his theory could adequately explain phenomenon such as Atlantis being swallowed whole by the sea, and many other equally preposterous myths. Hard as it is to believe, however, Cosmic Ice would eventually become adopted as official science by the Nazis, replacing all non-German theories of evolution. 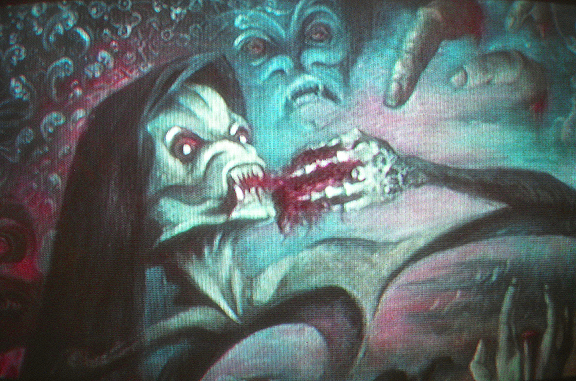 The giant skeleton in The Creeping Flesh is most probably derived from Hörbiger, or from Madam Blavatsky who also believed that previous civilizations were destroyed by moons that crashed to the earth: as the moon came closer to the earth, so the theory goes, its magnetic pull became greater thus reducing gravity, and so ancient men were able to grow to incredible size. Wilson proposes that without evil we could live forever. It is very similar to Hildren’s vision of the new Eden that would follow the eradication of the virus known as evil. Since Wilson is at heart a rationalist, believing in the clarity of thought over all else, he cannot fully appreciate how ridiculous his theme is. One cannot help but come away thinking that on some level he is earnest. There are, however, no such pretensions in The Creeping Flesh. Evil is far too complex to explain it away so simplistically. There is no little pill one can take to make things all better. Everything, in fact, in this movie goes terribly wrong. Evil simply begets more evil. One scene in particular rings true with the policies of the Bushevick administration and their cronies, including The Governator. Christopher Lee, who plays Hildern’s villainous half-brother who lords over an insane asylum, after realizing the nefarious potential effect of the poisonous blood on the human mind, wants desperately to steal the giant skeleton. “I don’t know,” his faithful assistant says. “There is a question of professional ethics.” Christopher Lee, appropriately for such a sadist, is unfazed. “Indeed, indeed,” he retorts. “That is why I will have to employ someone for whom ethics have no significance.” From Dubya’s torture policy to the Governator’s attempted end-around of Democratically elected Government in California, there is finally at long last some popular rebuke to those “for whom ethics have no significance”.